Prayer Associates commit to pray for and with Felician Sisters and Felician Associates. 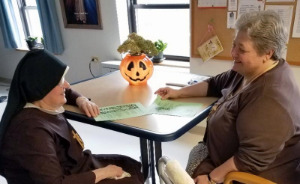 Prayer Associates do not take part in service activities, as their association with the Felician Sisters is mainly one of prayer. If you would like to learn more about the Felician Sisters, Felician Associates, and Felician Prayer Associates in your area or how to begin the inquiry and discernment process, please contact the area coordinator nearest you.